I love marinated mushrooms. I've tried a million recipes, and there are usually problems, but you can tinker and eventually you will get your beloved, velvety globes. But why do I keep trying recipes that aren't right? A few months ago I just poured what I thought would be a good marinating liquid — oil, vinegar, water, salt, herbs — into a pot and gently cooked the cleaned mushroom caps right in it. I didn't let them cook for too long (and this is a great opportunity for the chef to sample the food; after all, you're testing for perfection). You need enough liquid to nearly cover the mushrooms, but not more, because they will shrink and be adequately bathed at the end. 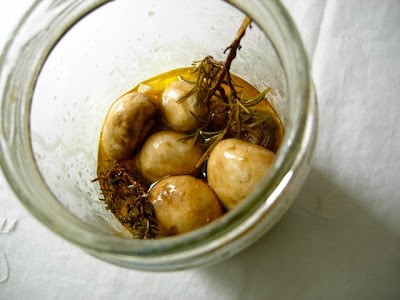 I did it again the other day, and while I think there may have been too much olive oil (it's surprising to know that water is good here, because too much vinegar would be gacky), it still resulted in a dreamy batch of fungal snackitude. I used a sprig of rosemary, a sprig of thyme and a fresh (bruised) bay leaf for about 20 little (but not tiny) white mushrooms. You'll probably want to remove the herbs when the mixture has cooled; I thought the flavor was just right at that point. Put 'em in a jar and wait a day or so while ideas come to mind. Raclette. Yes, that came to mind. I believe we will serve these babies instead of the traditional cocktail onions. Or maybe with. And I'm thinking, "Why did I wait so long to try this again? Would it be wrong to marinate mushrooms on a weekly basis?" No, it would not be wrong. It most definitely would not be wrong! You're making me pine for my mushroom logs, all covered in snow. No it would not be wrong, not even a tiny bit wrong. 'Shrooms are so very good for you after all. Will your mushroom logs regenerate after winter, or do you need to start over every year? I've never known anyone to have as much luck with them as you do. Mouse: They're good for you? Wow, that's lucky, because I have a Mushroom Tooth. "Gacky" is a terrific word, well used here! Cheryl: Merci! I liked that word myself. (Husband loved it.) And I do love vinegar, even drank a glass of it once. So gacky is as gacky does. Ooops, I may have misled you - apparently ucltivated white or "button" mushrooms found on supermarket shelves in the US are among a number of foods (inc celery, peanuts, peanuts & salted, pickled, or smoked foods) that contain natural carcinogens. Mouse: Oh, that? Cancer? Pshaw. Homemade shrooms are so much better than the stuff you pay a fortune for in the supermarket. I have always blanched the mushrooms first but your method seems better. Greg: I know. Throw away the mushroom-flavored blanching water? Hah. No need to. Thanks. Marinated mushrooms for Super Bowl.